Lisbon is lovely, a fading lovely, bleaching out and slightly weary, looking backwards and seemingly uncertain about itself. Residents, unprompted, talk openly about how cheap it is, how friendly and welcoming they are to the waves of mainly Germans and French rolling through, and an antique dealer in things of rare exquisiteness even brought forth a list of former colonies and went through each in faltering English, ending with Timor, 1975. He seemed unaware or too discrete to hint at Australia's role in the Indonesian takeover. But it is not particularly easy, at least at our age. The city of seven hills is exactly that and with every step cobbled, the blessing of staying upright is levied on the knees and feet. Rebuilt in a hurry after the 1755 earthquake, it's one of those cities where time seems to have faltered. In the 20th C, the wily Salazar steered the country around the second world war, and it was spared the worst of the ravages of postwar development. Poverty has some advantages. I've just finished Neill Lochery's Lisbon: War in the Shadows of the City of Light : essential visitor reading with its tales of wheeling and dealing, spies and spivs, gossip and intrigue, the tungsten trade, and the tragic details of the death of Leslie Howard, forever Ashley in my mind. 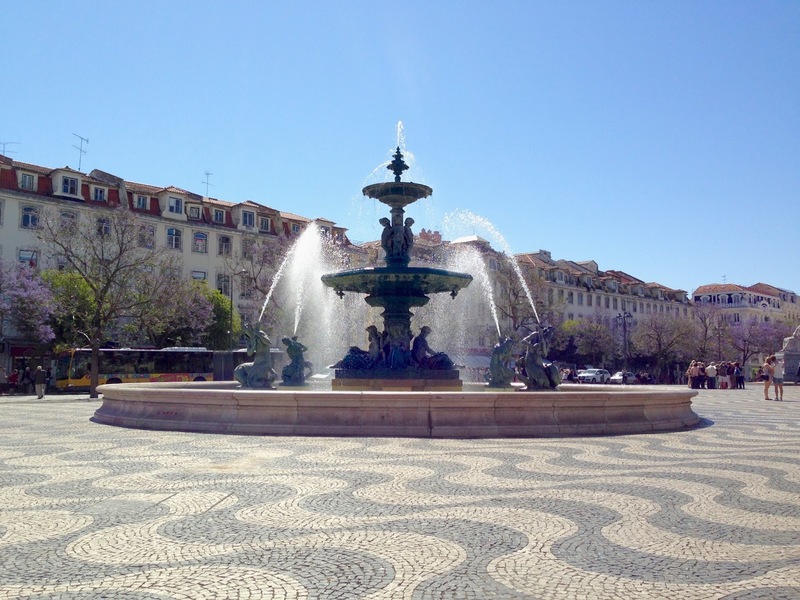 Our hotel by chance is at Rossio, the centre of it all. 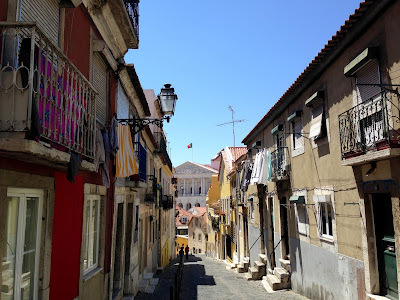 The one flat part of the city is the mainly retail area Baixa, abutting the river between the heights of the old moorish castle on top of the Alfama neighbourhood on one side and funky Alto on the other. But Baixa's crowded narrow streets are best rattled through and back again (gorged with tarts) on the crowded and charmlessly modern tram 15 to Belem, or on the equally ridiculously crowded old rattler tram 28 best caught in the early morning at its origin - at least you can get on and pity the poor locals who with unending generosity, and necessity, tolerate this disney-land of tourists. 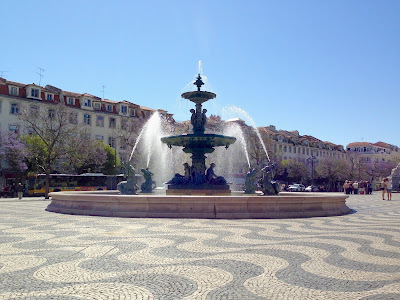 28 loops up and down around the city in a crazy figure of eight, the cross-over in Baixa (the flat part for anyone still following) scraping cars and hapless pedestrians off walls as it clatters its way through one of the most delicious tourist rides in the whole wide world. The round trip takes two hours. Not since Venice is one so assaulted by tourists and one's own status as same. Baixa, I should addd, is especially interesting for being that section of the city rapidly rebuilt with small dense housing to accommodate as many as possible as quickly as possible after the earthquake. It proudly carries the name of the remarkable Sebastian de Carvalho e Meioe, the first Marquis of Pombal who amongst so much else oversaw the reconstruction of the city and carries his name - the Pombaline part of the city along with its Pombaline architecture. A wonderful bit of travel writing (forgive the pedestrian phrase). 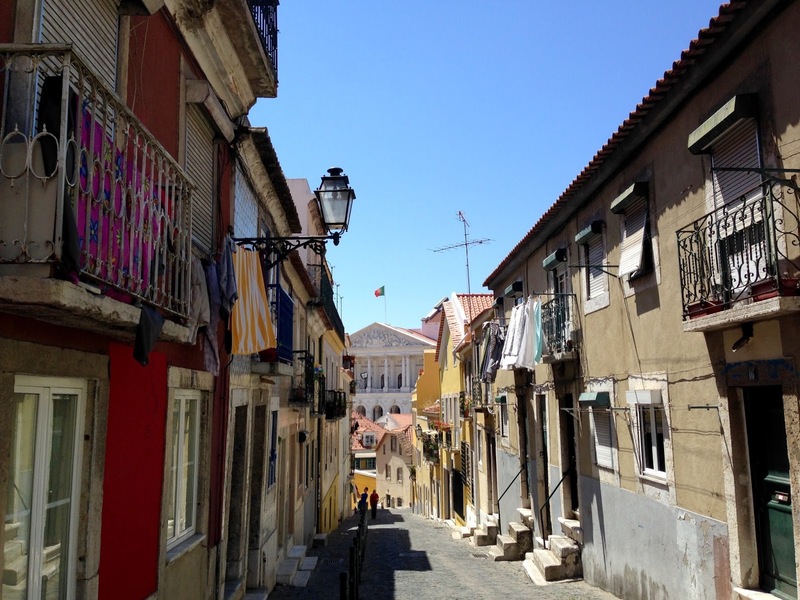 How did you come to choose Lisbon as one of the places you visited? A great blog. Thank you for sharing Lisbon so vividly. Thanks Sue. It was mostly word of mouth with tales of its slow sensuality. Also it was my parents first European city (by boat across the Atlantic) and I still remember as a small child the thrill of that postcard and the allure therein. Somehow I've closed a loop.